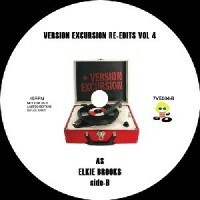 Version Excursion are back, hitting us with two more f-f-f-fresh edits slapped astride a fun-sized 7". Bursting out of the A-side is a nice re-run of Risco Connection's ace reggae-disco cover of McFadden & Whitehead classic "Ain’t No Stopping Us Now". The OG is a true-blue Loft classic, and this respectful edit leaves you in no doubt of its class. Over on the flip we feel the full wah-guitar force of Elkie Brooks' HUGE disco cover of Stevie's magnificent "As". Punchy, pounding and so damn funky, this is floor fuel of the highest grade. Get on it!